The map above is represented by the cities and counties of Harrisonburg, Bridgewater, Dayton, Mt. 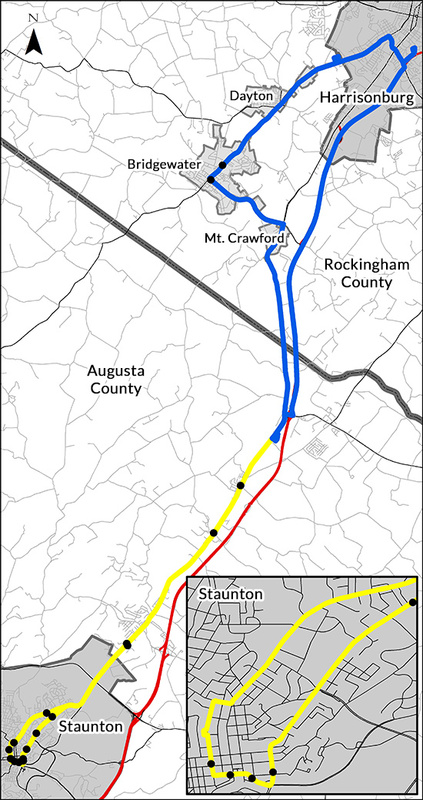 Crawford, Rockingham County, Staunton, and Augusta County. Route 11 NB/Dam Town Rd. Route 11 SB/Fort Defiance Rd. The BRCC North route connects to Harrisonburg Department of Public Transportation (HDPT) at the Godwin Transit Center, when they run at the same time. The BRCC South route connects to the 250 Connector and Staunton North & West Loops and Downtown Trolley at the Staunton Hub / Lewis Street, when they run at the same time. Evening service operates only Mondays through Thursdays. On Fridays, service terminates at 6:00 p.m. for the North route and at 5:30 p.m. for the South route. Routine Service Gets You To Work And School On Time. Our Blue Ridge Community Shuttle transports passengers to the BRCC campus in Weyers Cave on Mondays through Fridays. Shuttles connect the communities of Staunton, Verona, Fort Defiance, Mount Sidney, Weyers Cave, Bridgewater, Dayton, Mount Crawford, and Harrisonburg. Choose the route that works for you and enjoy routine, dependable bus service from your local community. Monday – Thursday, 7:00 a.m. – 11:00 p.m. and Friday, 7:00 a.m. – 6:00 p.m.
Monday – Thursday, 7:20 a.m. – 10:30 p.m. and Friday, 7:30 a.m. – 5:30 p.m. Affordable Fares Provide Rides To Fit Your Budget. Relax With Time To Yourself On The Road. Our reliable service lets you relax with a professional driver at the wheel. Our safe and efficient drivers turns your commute into down time. Enjoy a smooth ride to your destination while reading, relaxing, or checking your social media. We drive so you don’t have to! When you are ready to use our clean and safe service, review our tips for safe riding. You’ll learn the best way to ride the bus and friendly tips to get you where you need to be. Our personable customer support team and drivers welcome your questions; we are here to help! Ride The Blue Ridge Community College Shuttle!